Hi Friends,Hope you all doing good.I am sure you all had a great Diwali celebration.My Diwali went very well in my new house with my in-laws & family .As I was busy with some personal works,I was not able to make any post here.For Diwali, I made Badam burfi,Doodh peda,Wheat halwa ( I am yet to post all these recipes,may be for next Diwali or New year ),Thenkuzhal and Ribbon pakoda for my family.Apart from these sweets,I made Adhirasam,Suzhiyan & Vazhakkai bajji on Diwali day.We love to eat these deep fried stuffs more than sweets & other savories. Actually I had planned to make this post before Diwali.But I couldn’t do it.So Iam sharing it today.Every year my mom prepares potato bajji,Brinjal/Kathirikai bajji,Onion bajji and my most favorite Valakkai bajji( Raw banana fritters).I guess many of you make bajji & bonda with store bought bajji,bonda mix/powder.But my mom & MIL make bajji mix on their own.Basically I love tea shop Vazhakkai bajji a lot.Eating hot Vazhakkai bajji with a sip of steaming hot tea on a rainy day is a pure bliss! 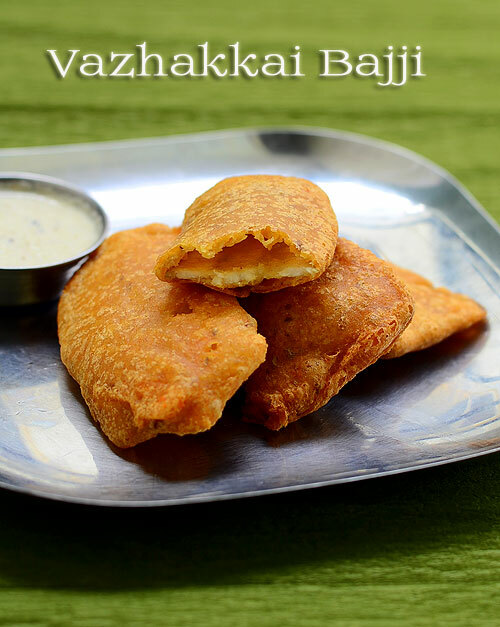 Try and experience it without worrying about the calories .Lets see how to make this easy,yummy South Indian style Vazhakkai bajji recipe. Check out my Onion bajji , Chilli bajji & Stuffed chilli bajji recipes. How to make Vazhakkai bajji / Raw banana fritters ! In a wide bowl , mix all the flours , powders , Ajwain or cumin,salt,cooking soda and add water to make a slightly watery batter( like dosa batter). 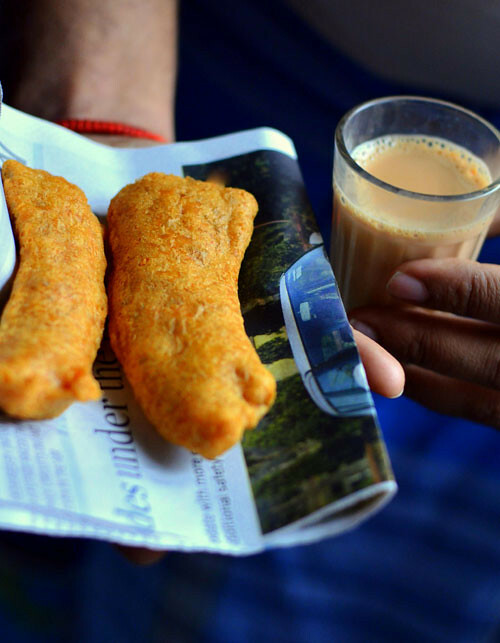 If u make it too watery, bajji will have tails .At the same time,thick batter yields hard bajjis..The batter should be slightly thick & flow like a ribbon.It should coat the onion pieces well.Adjust water & flour accordingly. Wash and cut the raw banana into two horizontally.Peel the skin and discard it.Slice the raw banana thinly and arrange in a plate.Dip the raw banana in bajji batter. Heat oil in a kadai and check with a drop of batter to find the correct heating point.ie. If u put a drop of batter , the batter will rise immediately and floats on top. As soon as u get this heating point , simmer the flame and drop the raw banana slices coated well with batter. Deep fry till the color changes golden brown and the bubbles ceases.Flip it and again cook for a minute. Drain & remove in a tissue paper. Enjoy with tea/coffee! Addition of food color gives a nice color to bajji as u see in stalls. Please don’t skip adding soda . It gives a puffy , soft bajji. Make sure u don’t add too much because bajji will be very oily and it is unhealthy too.. Adjust the consistency of batter.. Batter should not be too thin or too thick. If ur batter has become too thin , add besan & rice flour in 3:1 ratio and adjust the batter.If it is too thick add more water. Always add the extra water using a tbsp & check it. 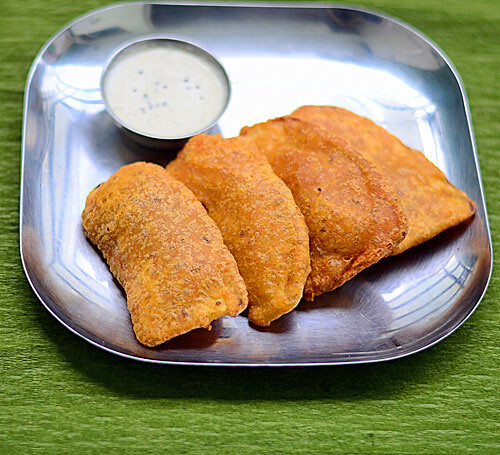 Enjoy puffy,hot Vazhakkai bajji as an evening snack with your family !